To me, getting a new book is like being a child that is holding a Christmas present waiting to be unwrapped. Only instead of shaking the box, I inspect the jackets, look at the pictures and reread the reviews in anticipation. Whatever is inside…waiting, I want to savor and appreciate the whole experience. Natalie Moore is about to lose what little cleavage she had. She’ll shave her head, leave her church, fall for a man in scrubs, learn to tap, and flash a roomful of women. Natalie needs to know with or without her breasts she is more than the sum of her parts. ***** This is a five star book. I finished it in a night. I would recommend it to anyone. 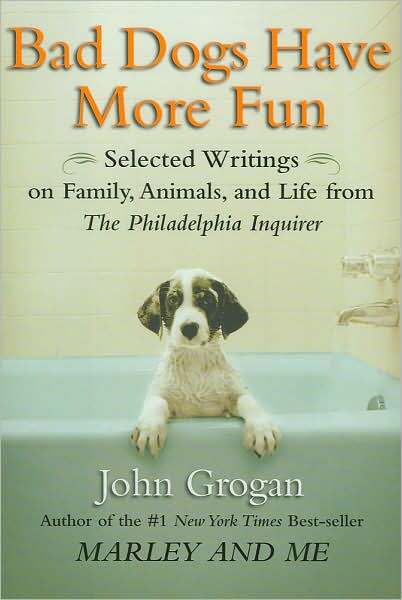 Whether about animals and family pets, children and adults, or family and friends, this unique collection of columns continues where the warmth of Marley and Me left off as Grogan shares his opinions and experiences about life, animals and family. Shattered Dreams is about Irene Spencer’s life as one of 10 polygamist wives. 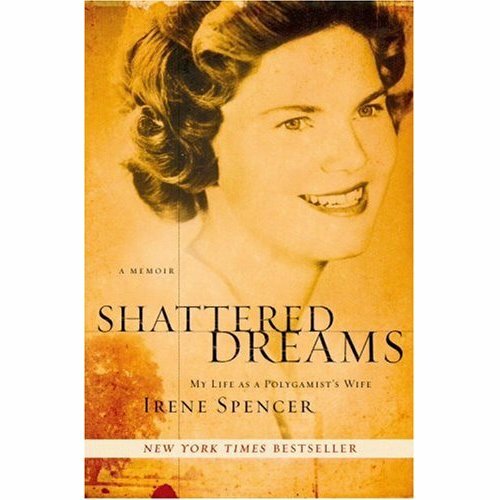 I’ve been reading Shattered Dreams by Irene Spencer and have barely put it down. It’s is an amazing story. It reads like page-turner fiction. But, it’s not. It is a close up look at Fundamentalist Mormanism from someone who has been there. Irene Spencer shows polygamy in a way that “Big Love” doesn’t. She writes of the pain sharing her husband with nine other wives all vying for his attention and affection. Irene describes a life without running water or electricity and of living in abject poverty in the Mexican desert, raising 13 of her husband’s 58 children. Shattered Dreams rated 4 1/2 stars out of 5 on Amazon. It is a New York Times Best Seller. It definitely is holding my interest. 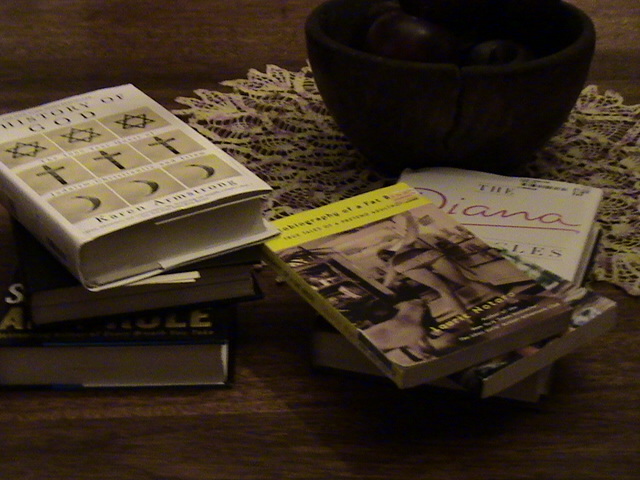 Books I am reading in August. This searching, profound comparative history of the three major monotheistic faiths fearlessly illuminates the sociopolitical ground in which religious ideas take root, blossom and mutate. Armstrong, a British broadcaster, commentator on religious affairs and former Roman Catholic nun, argues that Judaism, Christianity and Islam each developed the idea of a personal God, which has helped believers to mature as full human beings. Yet Armstrong also acknowledges that the idea of a personal God can be dangerous, encouraging us to judge, condemn and marginalize others. Catherine Crier, author, attorney, legal analyst, and host of Court TV’s “Catherine Crier Live,” gives an expert reading of her investigation into the Susan Polk murder case. In 2002, Polk stabbed her husband of over twenty years 27 times, then washed and put away the knife, and went to bed. Crier exposes the couple’s twisted interactions, beginning with Susan’s molestation by Felix when she was a teen and he was her therapist, and continuing through his abuses within their marriage. Hillary Rodham’s childhood was not the suburban idyll suggested by the shaded front porch and gently sloping lawn of what was once the family home at 235 Wisner Street in Park Ridge, Illinois. In this leafy environment of postwar promise and prosperity, the Rodhams were distinctly a family of odd ducks, isolated from their neighbors by the difficult character of her father, Hugh Rodham, a sour, unfulfilled man whose children suffered his relentless, demeaning sarcasm and misanthropic inclination, endured his embarrassing parsimony, and silently accepted his humiliation and verbal abuse of their mother. That triumphant crow crowned months, if not years, of meticulous plotting — not only by Diana, but also by the desperate-for-a-virgin-bride Windsor tribe, all laid out here for our delectation like a really good hunt breakfast. It also heralded the dawn of 16 years of hell. Hell for Di, hell for the Royals, hell for everyone but the press — hell that didn’t even end on Aug. 31, 1997, the night the black Mercedes carrying Di and her coke-snorting beau crashed into a wall of the Pont D’Alma tunnel in Paris, kicking off a decade of conspiracy theories, to which Brown gives a rather cursory and politic nod. If you’ve read any of these, what did you think? I read the Diana chronicles.. 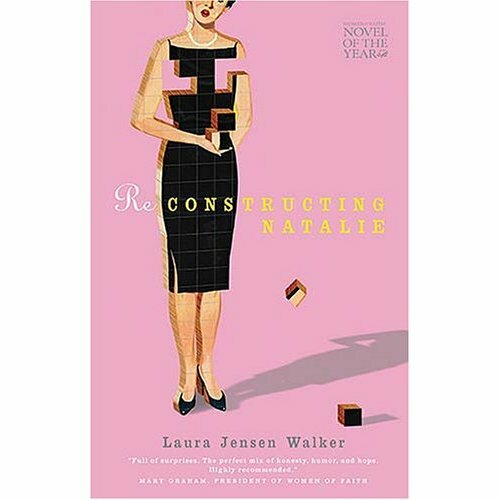 It was a very sad story but the book rather sensationalizes all the “juicy details”; dwelling lovingly on Diana’s insecurities and anorexia. My goodness if anyone was to discover that their “Prince Charming” was actually a two timing jerk still carrying on with the Rottweiler on one’s wedding day, then they should be allowed to be a bit anxious and insecure! I’m kind of a royal fanatic, too. Thanks for your review. I will let you know what I think after I read it. From what you said, it sounds like the author may have been doing damage control toward one party by trying to tarnish the reputation of the other. I know, Diana was SO beautiful and the quintissetial princess, it sure hurt us all when we realised how horrible her, “happily ever after”, really was.. Yes it has been a while since I read it, but I know it seemed very biased. Yes do let me know what you think of it! I’ve read A Woman in Charge and The Diana Chronicles. Enjoyed them both but was astonished when the Times came out with its notable books of the year last week that Tina Brown’s made the list but Carl Bernstein’s did not. I think they got it backwards. Totally. I saw the Times list and I absolutely agree that they got it backwards! I also agree with Merrimerri that the Diana Chronicles seem biased. I enjoyed them both, though.